The Mogoa Caves or Grottoes, also called the Caves of the Thousand Buddhas, are located in Dunhuang, in the Gansu province of China. 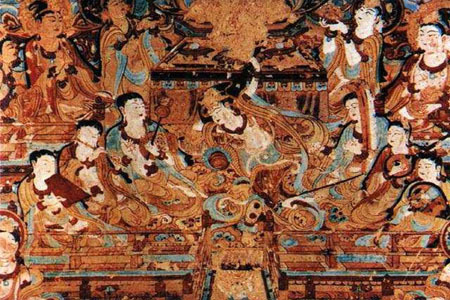 The caves consist of over 15 miles of tunnels, meditation grottoes and temples, most of which are adorned with Buddhist art (the entrance is shown to the left, sample painting below). The caves and paintings were created over a 1,000 year period and are considered some of the finest Buddhist art in the world. The caves were designated an UNESCO World Heritage site in 1987, and about 30 of the currently known 600 cave temples are open to the public. 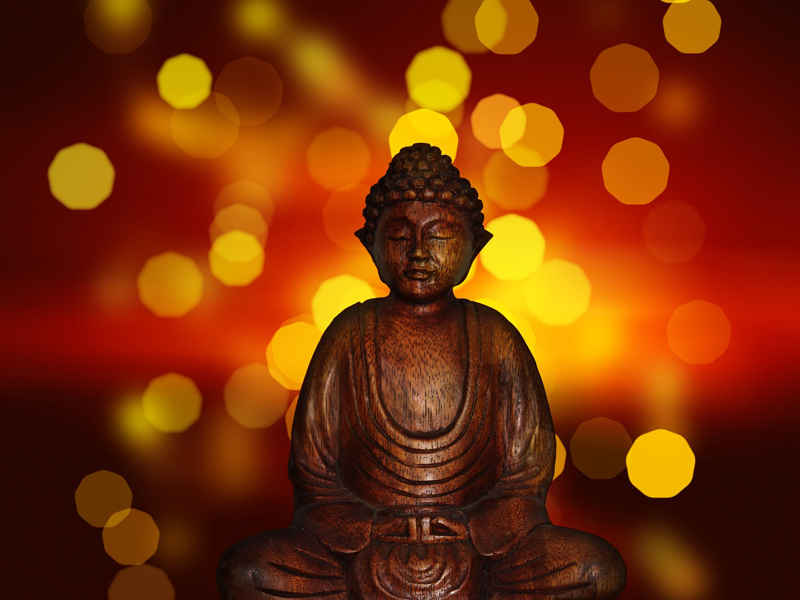 According to legend, in the 4th century AD a Buddhist monk was inspired to create the caves based on a vision he had of a thousand Buddhas. The caves were originally each solitary retreat quarters for devout monks. 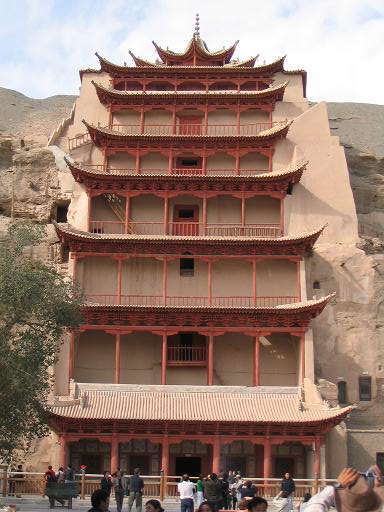 Because the caves were located along the famed Silk Road of China, thousands of travelers, including monks and Buddhist scholars, passed by them regularly, and many stopped to aid the excavation and painting work, some staying for years or even a lifetime. From the 7th to 10th centuries, a period known as the Tang Dynasty in China, Buddhism spread throughout China, and monastic communities were at their height. As many as a thousand cave temples are believed to have been occupied during this period at Mogoa. In later centuries though, trade migrated to sea routes, and as the Silk Road became less traveled, the caves gradually fell into disuse. However, because so many of the Silk Road travelers had carried manuscripts - both Buddhist and otherwise - the caves had been a gathering place for these teachings. At one point thousands of these manuscripts, including versions of many Buddhist sutras, were apparently discarded or stored in a vault area of the caves that was later walled in. In the early 1900s, a caretaker for the caves discovered these works, dating from 400 to 1000 AD. Some of these were sold to Western explorers, but the majority are now owned by the Chinese government. Archaelogical work continues at the caves, and almost 300 new caves were discovered as late as the 1980s.